This is definitely one for the grown-ups; grown-ups who love whisky and honey. Rich, deep in flavour and quite alcoholic, you could almost apply the description tira-mi-su – pick-me-up – but unlike the Italian dessert of that name, this one has Scottish overtones. It was my son’s idea. Perhaps it came from seeing the bottle of Chivas Regal sitting on my dining table, a gift from the cocktail and canapé pairing event with Chivas Brothers I went to a few weeks’ ago. Chivas Regal 12 Year Old Whisky has been described as a whisky ‘for grown-ups … a very refined blended whisky with herbs, honey and fruit’ so the honey addition was likely to work well. I guess some people might think it sacrilege to ‘waste’ it on ice cream but the thing about cooking with alcohol is that you only get really good results if you use really good ingredients. 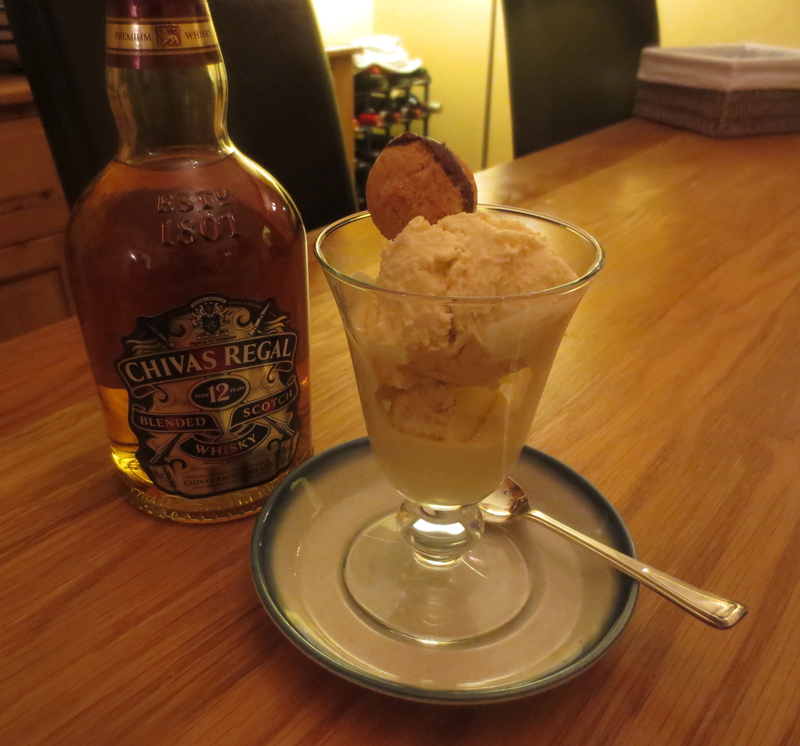 Yesterday, with Jonathan cooking the main part of the evening meal it seemed a good opportunity for me to turn my attention to dessert and the ‘honey and whisky ice cream’ was born. Jonathan and I discussed the making of the ice cream. When you love food and cooking, discussion about how to cook something is part of the pleasure. If I started with my basic ice cream recipe, should I substitute all or half the sugar with honey? Should we add vanilla? How much whisky would be right? In the end, I used the equivalent amount of honey as I’d normally use sugar and we added the whisky once the custard was made, testing as we went until it seemed right. Of course, adding it at the end means the whisky retains its alcohol (hence an ice cream for grown-ups) and you have to also remember that spirits don’t freeze so too much will stop the ice cream ‘setting’, but an advantage is that when you get it right, it stays nicely soft. First of all I made the vanilla ice cream: I put 6 egg yolks, 1 teaspoon custard powder (to stabilise the custard when cooking) and 1 teaspoon vanilla paste into a bowl and whisked till creamy. 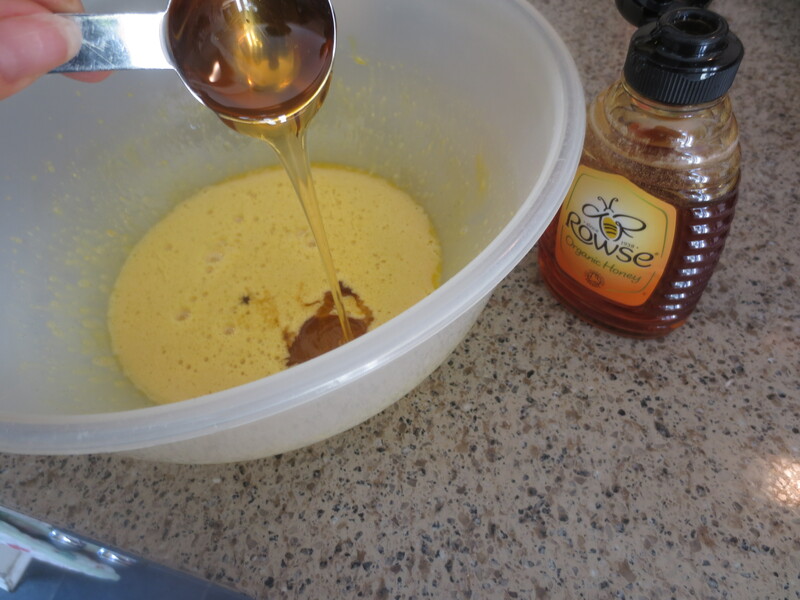 Then I added 8 tablespoons runny honey (120ml and equivalent to the 120g of sugar I normally use) and whisked some more until it was all well combined. The honey I used has quite a strong flavour; remember the honey you choose to use will affect the final flavour of the ice cream. I heated 300ml milk till bubbles appeared at the edge, then slowly poured it into the egg mixture, whisking until smooth, and tipped it all into a clean saucepan. 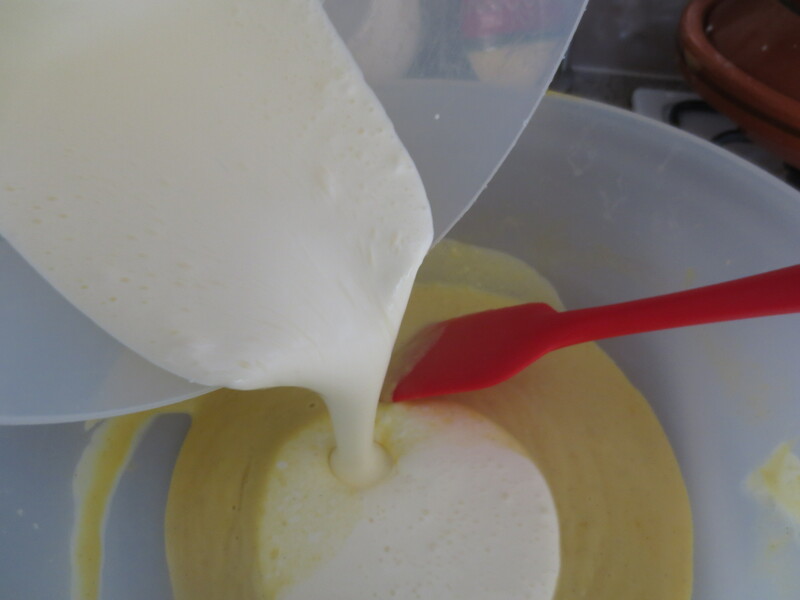 Over a medium heat, I stirred until the custard came almost to the boil and was thickened (using the custard powder – or cornflour – enables you to do this without risk of the mixture separating). I poured it back into a bowl and left to cool completely before adding 300ml double cream, whisked until just thickening but not stiff. Now it was time to add the whisky. 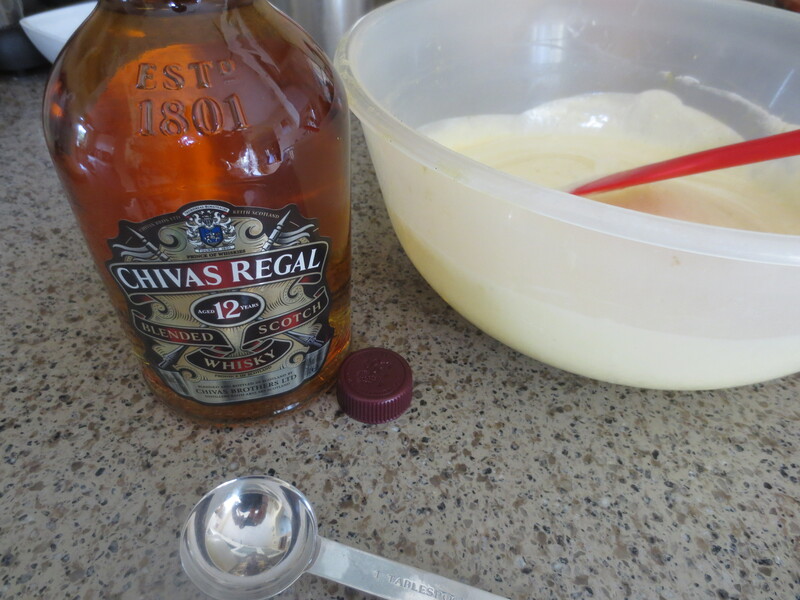 I added 3 tablespoons; Jonathan tasted and said it needed a little more – so it was 4 tablespoons whisky in all. Now for the final stage: pour the mixture into an ice-cream maker and churn until thick. Transfer to a freezer container and freeze until needed. The weather was turning as suppertime approached. The balmy evenings we’ve been enjoying for weeks, sitting comfortably outside in the garden until darkness falls, have been overtaken by the tail end of Hurricane Bertha. Lyndsey and I sat outside with aperitifs while Jonathan barbecued chicken and halloumi but as the wind got up and dark clouds filled the skies, we decided to move inside to eat the meal. 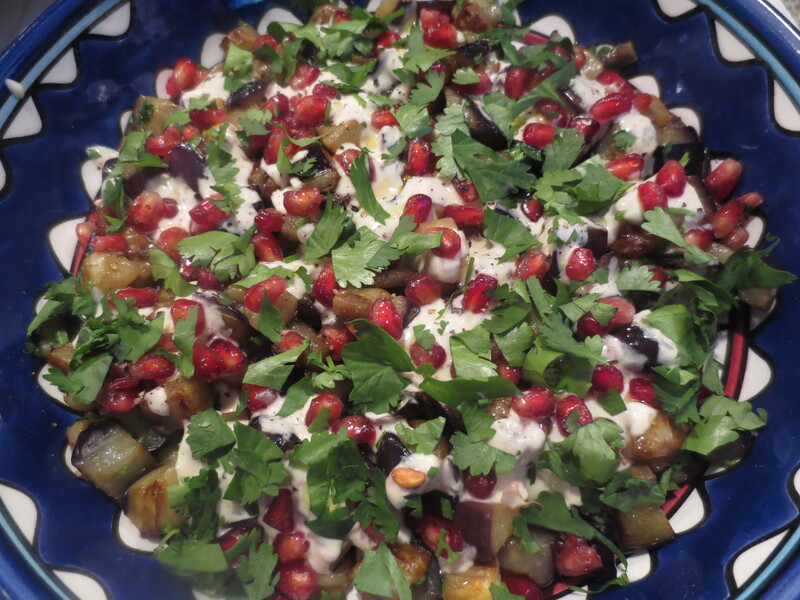 Jonathan had prepared a wonderful aubergine dish to go with the meat and halloumi – aubergine cubes gently fried in olive oil with a tahini dressing, pomegranate and coriander. When it came to dessert we scooped creamy mounds of whisky and honey ice cream into glass dishes. ‘We’ because I put some in the dishes and Jonathan topped them up with an extra scoop! It’s really a quite wonderful ice cream. Indulgently rich and creamy with the caramel taste of dark honey and a deep, warming glow of whisky; it both warms and cools you at the same time. And yes, it’s a sophisticated taste that’s definitely one for the grown-ups! Chivas – the whisky of Paris in the 60’s. Brave to try whisky in food – I struggle with that although the Spanish go crazy with it in their desserts. Happy Sunday. Thanks, Gareth. It goes well in Dundee cake too! Yum, I wish I could have been sitting at your dinner table. The Aubergine looks delicious and I know I would certainly enjoy the ice cream. I don’t think I would have been quite so bold with the whisky content without Jonathan’s encouragement! 🙂 It is very good though.